CONVERSABLE ECONOMIST: What Should Banks Be Allowed To Do? Charles Morris offers a nice overview of the course of bank regulation in the last century or so in "What Should Banks Be Allowed To Do?" It appears in the Fourth Quarter 2011 issue of the Economic Review published by the Federal Reserve Bank of Kansas City. For me, the article serves two useful purposes. First, it's a reminder of why bank deregulation in the 1980s and 1990s wasn't some clever ploy by the financial-sector lobbyists, but was absolutely necessary given the evolution of the industry at that time. To be sure, the deregulation could have been carried out in different ways, posing different risks, but some kind of deregulation was unavoidable. Second, it makes the case for limiting what banks are allowed to so. I'm completely persuaded that the proposed reform would make the banking sector safer and with less risk of needing a bailout, but I'm less sure that the reform would make the financial sector as a whole safer. Let me say a bit more about each of these, drawing heavily on Morris's exposition. The banking sector as it emerged from the 1930s had five characteristics salient for the discussion here: 1) it was overseen by bank regulators for safety; 2) it had access to a public safety net of emergency loans from the Fed and deposit insurance; 3) it was forbidden to go into other financial areas like investment banking, securities dealing, or insurance; 4) it faced legal limits on the insurance it could pay on deposits; and 5) it faced geographic restrictions on branching across state lines and within states. In short, it was an industry that was shielded from competition, limited in what it could do, and heavily regulated. In the 1970s, the wheels began to come off this wagon. Those who wished to save money began to seek out investment options like mutual funds, including money market mutual funds, and insurance companies. Banks were limited in the interest rate they could pay, and inflation was high. Banks began to hemorrage deposits. Those who wished to borrow money found other options, too. They borrowed through commercial paper, through high-yield bonds, and through securitized markets including mortgage-backed securities and asset-backed securities. Separate finance companies made car loans and loans for retail purchases. Other companies financed trade receivables. In short, both the savers and the borrowers were migrating outside the banking industry. Instead, the process of financial intermediation between savers and borrowers was happening outside the banking industry, in what came to be called the "shadow banking" sector. If the banks had not been deregulated and allowed to compete in this new financial sector--at least in some ways--the banks themselves would have shrunk dramatically and a very large part of the U.S. saving and borrowing would have passed completely outside the purview of the bank regulators. also rose sharply (Table 1). 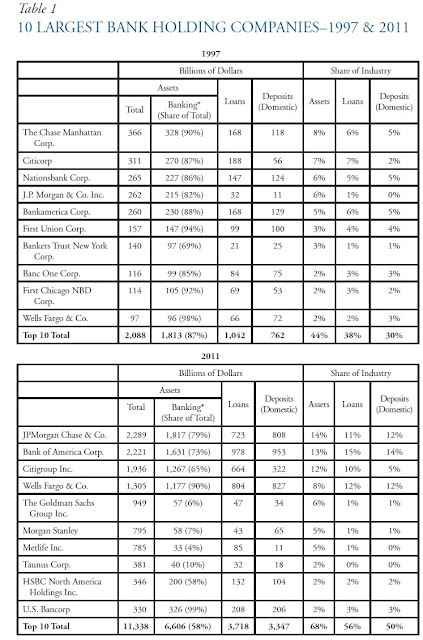 In addition, only four of the 10 largest BHCs that existed before the passage of the GLB Act remain today (Citigroup, JPMorgan Chase, Bank of America, and Wells Fargo), with those four BHCs having acquired five of the other top 10 BHCs. "Table 1 also shows how the activities of the 10 largest BHCs have changed in the past 14 years. 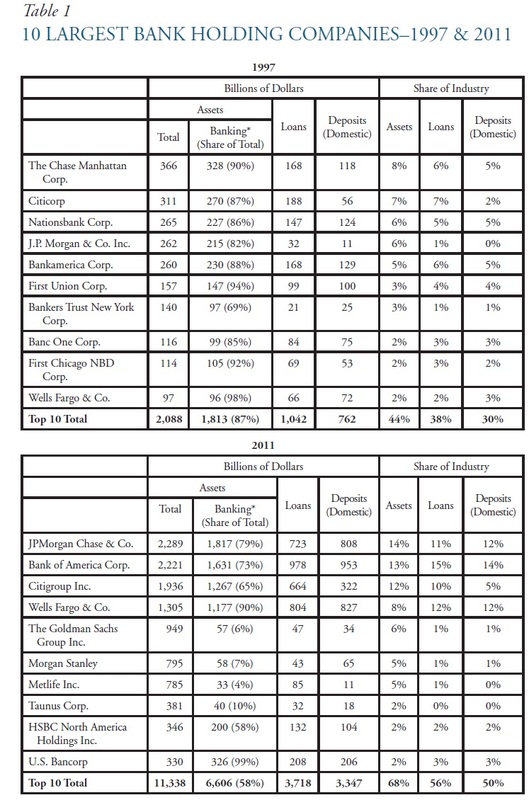 In 1997, the share of banking assets relative to total assets at these companies was 87 percent, with only one company having a share less than 80 percent. Today, the share of banking assets is 58 percent, with only two BHCs having a share greater than 80 percent." Commercial banking—deposit taking and lending to individuals and businesses. Investment banking—underwriting securities (stocks and bonds) and providing advisory services. Asset and wealth management—managing assets for individuals and institutions. Dealing and market making—intermediating securities, money market instruments, and over-the-counter derivatives transactions for customers. Brokerage services—brokering for retail and institutional investors, including hedge funds (prime brokerage). Proprietary trading—trading for an organization’s own account and owning hedge and private equity funds. The key distinction here for Morris is that underwriting securities and providing advice are largely fee-based services. They don't involve putting much of a bank's capital at risk. Dealing, market-making, hedge funds, and private equity all involve taking risks with capital that are harder both for the institution to understand and for regulators to monitor. Morris's proposal is certainly sensible enough, but it does leave me with a couple of questions. First, if banks were holding lots of mortgage loans, as they clearly could be under Morris's proposal, then they would have been vulnerable to a meltdown of housing prices like the one that has occurred. Thus, it's not clear to me that anything in this proposal would have limited the very aggressive home lending that occurred or the price meltdown afterward. Indeed, the sort of limited banks Morris advocates might in some ways have been relatively even more exposed to losses in the housing market. Second, Morris's proposal, like all "narrow bank" proposals, would clearly make the banking sector safer. But one of the disturbing facts about the financial troubles of 2008 was that it wasn't just commercial banks that were deemed to be systemically important to the U.S. economy: it was also investment banks like Bear Stearns, money market funds, insurance companies like AIG, brokers that sell Treasury bonds, and others. Focusing on banking is all very well, but the shadow banking sector and the potential risks that it poses aren't going away.